On an offense loaded with top-notch skill position talent, Torreahno Sweet often stood out from the rest. 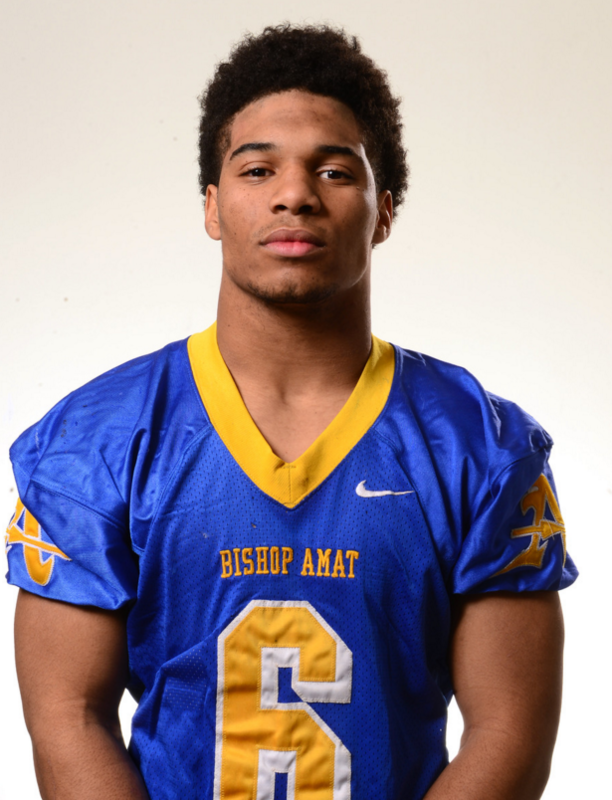 Sweet, Bishop Amat High School’s running back, was determined to run his team to Pac-5 Division prominence and put himself in the record books along the way. Mission accomplish on both fronts. After helping the Lancers win 10 games, a share of the Mission League championship and carving his name into the school’s lofty football record book in two different places, Sweet is the 2015 Tribune Player of the Year. Throughout the season, Sweet put up huge numbers against top competition. His finally tally of 1,971 yards rushing and 35 touchdowns are remarkable considering he missed seven quarters due to suspension and was often lifted early from other games because Amat was up big. Although Sweet twice flirted with former Lancers great Ralph Brown’s single-game touchdown record of six scores, he was stopped short at five against Chino Hills and Crespi by having to sit out with the rest of the starters due to lopsided scores. Still, Sweet’s 37 total touchdowns easily surpassed Donnie McCleskey’s season record mark of 29 set in 2001. Sweet also set the school record for rushing yards in a game by breaking Michael Wagner’s mark of 369 yards with a 380-yard performance against Oaks Christian in the second round of the playoffs. Sweet burst on the scene toward the middle of his junior season. He was out to prove he was capable of more his senior year. Sweet started off with a bang in a two-touchdown performance against Mater Dei. From there, he proceeded to rattle off nine games with 100 yards or more rushing. Sweet also had a nose for the end zone and had eight games with three or more touchdowns rushing. 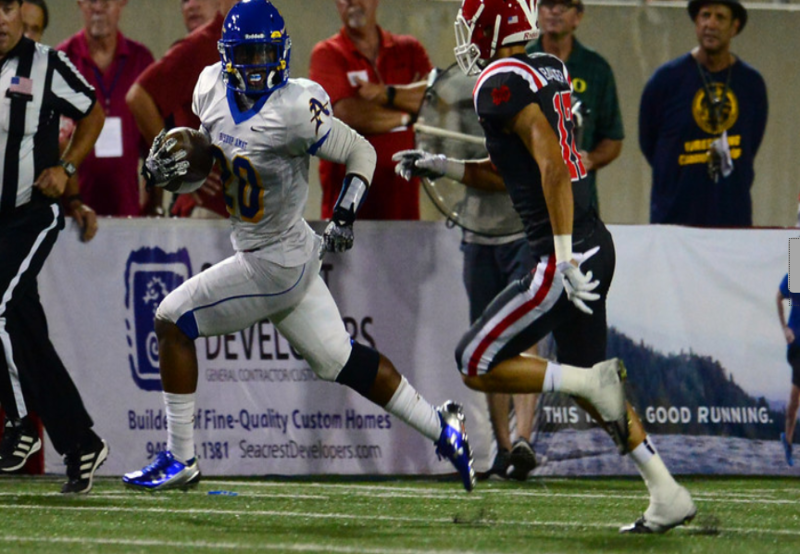 He was named Offensive Player of the Year in the Mission League after helping Amat tie for the league title with Serra. The Lancers made it back to the semifinals for the second consecutive season, but ran into a juggernaut in St. John Bosco, who sent Amat packing. But Sweet can’t be anything but happy about what he and his teammates accomplished. Big-time running backs are synonymous with Amat, so Sweet knows his stay atop two categories in the record may be short. But for those who lived it, Sweet won’t soon be forgotten. “Last year, I opened the record books and saw all the names and said I wanted to be better than those guys,” Sweet said. “I aimed high. When you aim high, sometimes when you fall short, it’s not by that much. 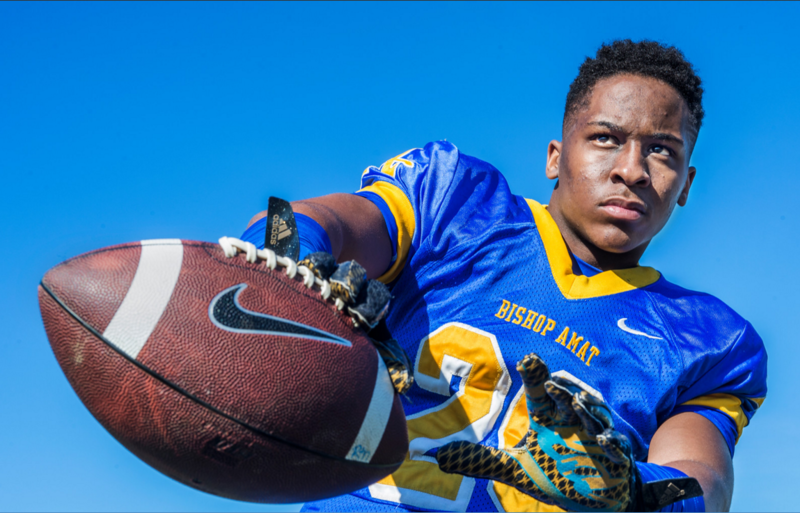 The numbers posted by Charter Oak High School football standout Zion Echols are impressive enough on their own. But when one considers Echols did what he did while playing with two broken wrists, the numbers are downright unbelievable. After rushing for 2,147 yards and 37 touchdowns, and adding another 300 yards receiving with four more scores to go along with three kick returns for touchdowns, Echols is the Tribune’s 2015 Offensive Player of the Year. Only after the season did it come out how close Echols was to missing his senior season entirely. Echols figures he broke both wrists at different times during the summer passing circuit. He didn’t realize how serious the situation until the pain wouldn’t subside. Against doctor’s orders, he decided to play rather than sit out. Echols will have surgery on both wrists soon and will miss about six months of the offseason before playing at his college destination. He is deciding between Cal and Washington St.
You’d never know it by looking at the final statistics. Echols was the picture of consistency. He ran for 100 yards or more 13 times this season while helping Charter Oak sweep the Hacienda League. Echols was named MVP of the Hacienda League and was an all-CIF Central Division selection. 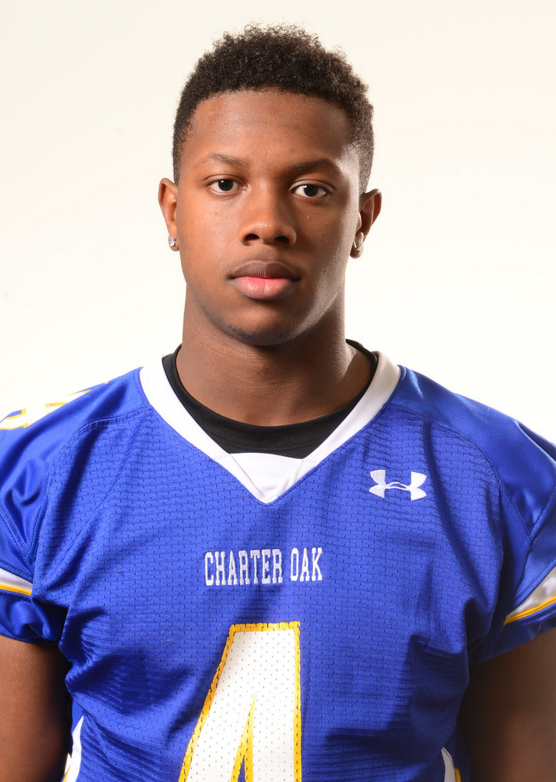 With Echols pounding the ball, Charter Oak advanced all the way to the Central Division championship. 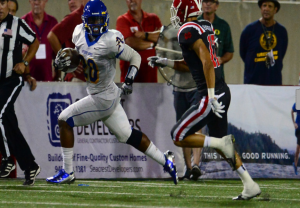 Despite all of his individual success, Echols said the highlight of his season was the Glendora game in Week 5. Although he had 173 yards rushing that night in a 28-7, that wasn’t the reason it was special. “Our coach (Bud Reich) died that week and we wanted to make sure we won it for him,” Echols said. The backbone to the San Dimas High School football team’s success this season was its defense. The Saints got downright stingy at the right time of year and because of that had one of the best postseason showings of any area team by reaching the CIF-Southern Section Mid-Valley Division championship game. At the heart of it all was three-year starting linebacker Josiah Erickson, a menacing force who was strong against both the run and pass. 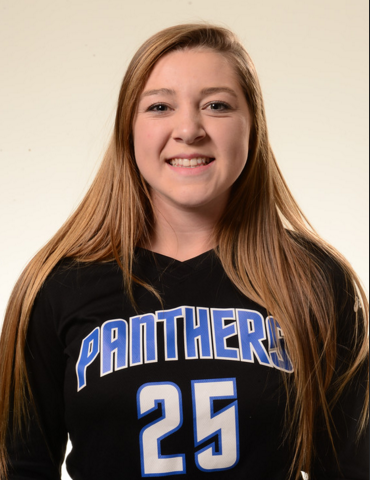 After leading San Dimas to a 10-win season and being named Valle Vista League Defensive MVP and all-CIF Mid-Valley Division, Erickson is the Tribune’s 2015 Defensive Player of the Year. Erickson ranked among the area leaders this season with 158 tackles, including 18 tackles for loss, and 15 sacks. He also caused and recovered three fumbles. Consistency was the name of Erickson’s game. He average 11.3 tackles per game and was seemingly always somewhere in the pile. Erickson had one of his best games in San Dimas’ biggest win of the year, a second-round road upset of highly ranked Paraclete. That night, not many people gave the Saints a shot, but San Dimas left Antelope Valley College with a 43-28 win. Erickson had 14 tackles, including 10 solo and two sacks. It was one of his finest games and certainly big reason why San Dimas’ season last 14 games. San Dimas fell short of a CIF championship against Sierra Canyon, but it wasn’t for lack of effort. The Saints held powerful Sierra Canyon to its season low in points (20). It was difficult way to go out for Erickson, but that night he and San Dimas’ defense left the field knowing it had made a strong point. Erickson will play on Saturdays next fall, but where is the question. He has offers from Montana St. and Sacramento St., and will decide where he will attend closer to signing day. In the meantime, he’s not concerned about personal legacy but rather how he helped an entire program accomplish big things. 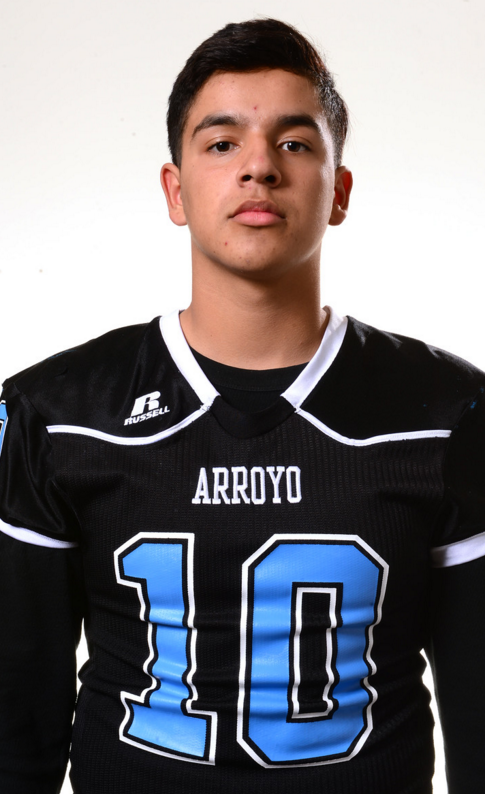 A year ago at this time, Pantoja was coming off a season as Arroyo’s junior varsity quarterback and varsity special teams player. Not exactly the kind of resume that leads one to believe greatness would soon follow. But Pantoja proved them all wrong. In his only varsity season, the senior threw for 2,931 yards and 29 touchdowns to go along with 407 yards and 11 touchdowns. 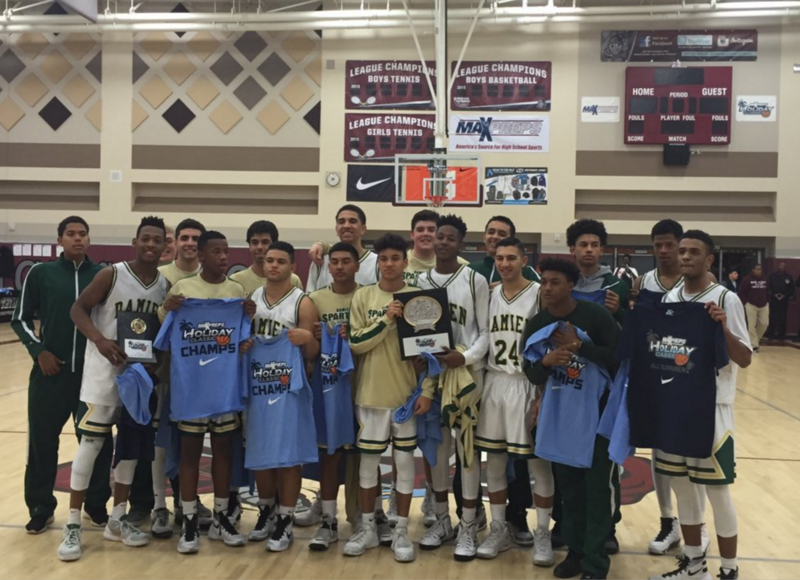 The result was a sweep of the Mission Valley League for the Knights. 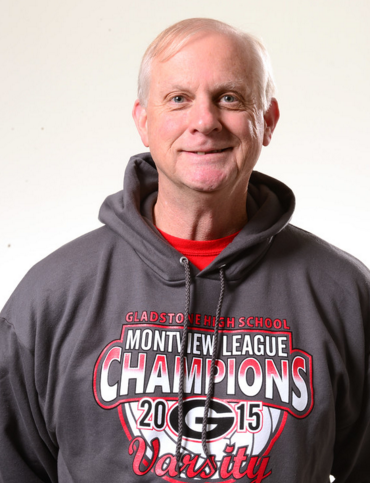 Holman followed his predecessor Bill Zernickow, a two-time CIF champion at the school, with better success than most anticipated. 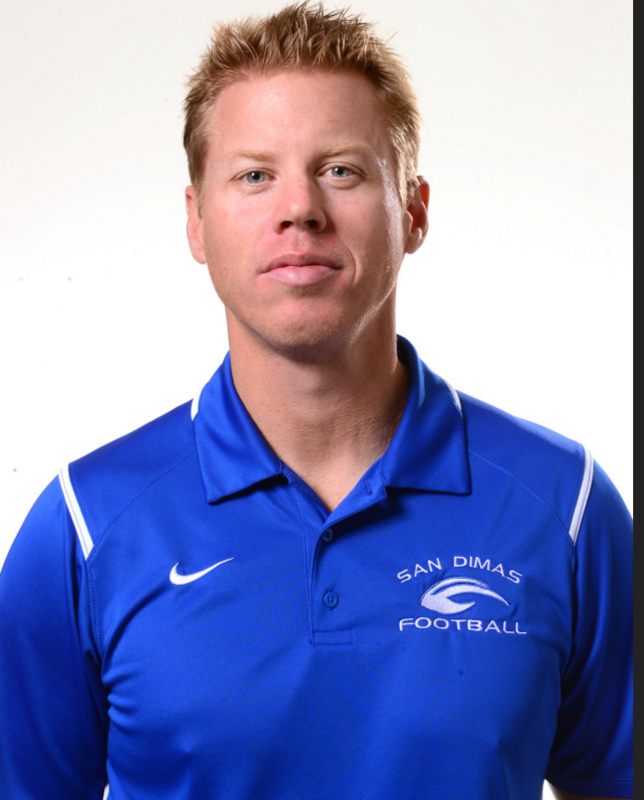 The 41-year-old Holman, in his first head coach job, won 10 games and took San Dimas on an improbable run to the Mid-Valley Division championship game. The Saints did as an unseeded second-place team from the Valle Vista League. Their upset of No. 2 of Paraclete was arguably the best playoff win in the area. 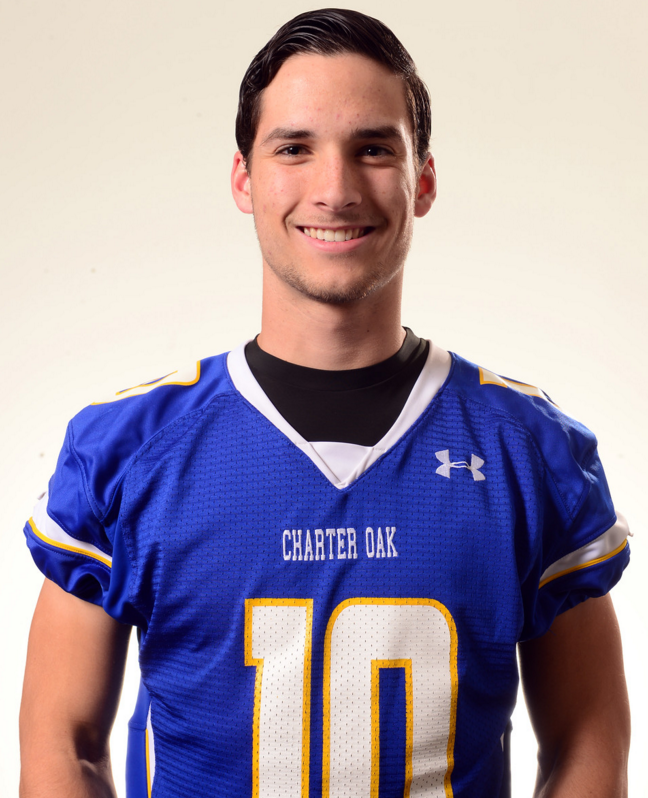 KAMDEN BROWN, Quarterback, Charter Oak, Sr.
Brown piloted a Charter Oak offense that averaged nearly 42 points per game. He threw for 2,749 yards and 31 touchdowns. Brown also added 325 yards on the ground with four more scores. He had 10 games with two or more touchdown passes and was named first-team all-Hacienda League for the second consecutive season. 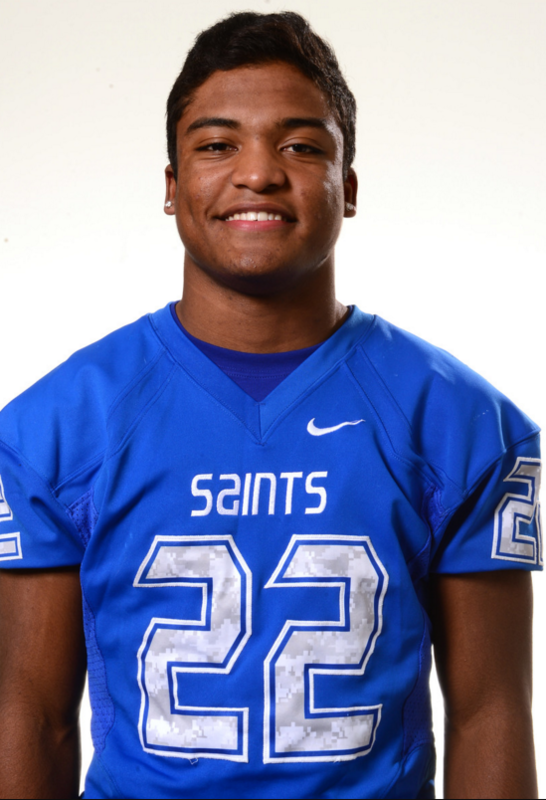 JARRELL SYKES, Running back, San Dimas, Jr.
Sykes was San Dimas’ workhorse back as the Saints rolled all the way to CIF-Southern Section Mid-Valley Division finals. Sykes was one of the area’s top rushers with 2,129 yards and 28 touchdowns. Sykes had 11 games with 100 yards or more rushing. 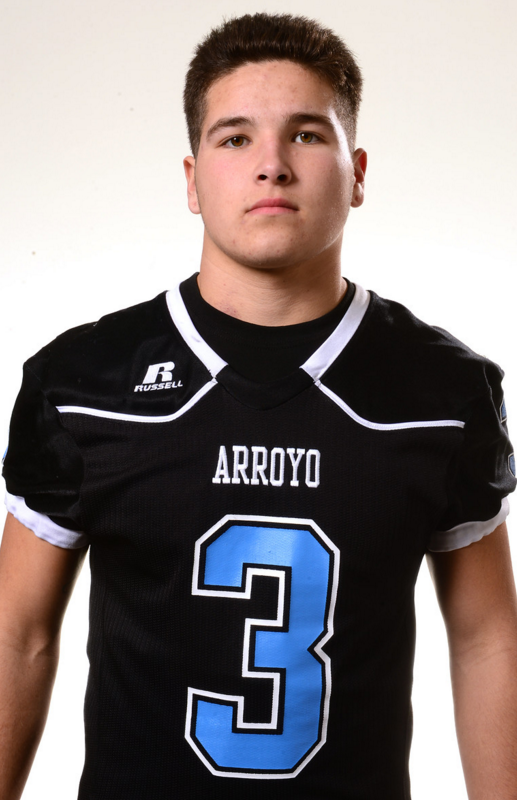 He was named first-team all-Valle Vista League at both running back and defensive back. 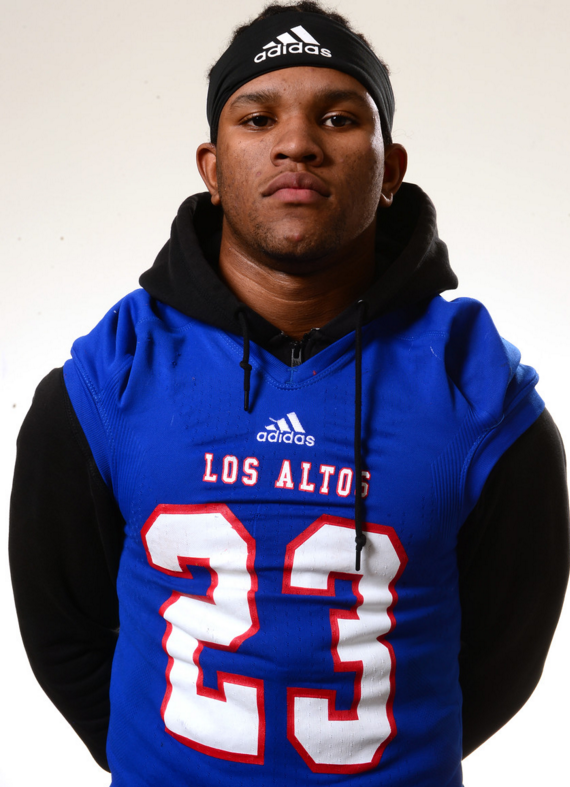 TYLER NEVENS, Running back, Los Altos, Sr.
Nevens was one of the most consistent producers in the area this season. He ran for 100 yards or more in every game this season and finished with 1,560 yards and 21 touchdowns. Nevens’ top-two games were a 225-yard and 269-yard, respectively, against Charter Oak and West Covina in back-to-back weeks. He was named Offensive MVP of the Hacienda League and was all-CIF in the Central Division. 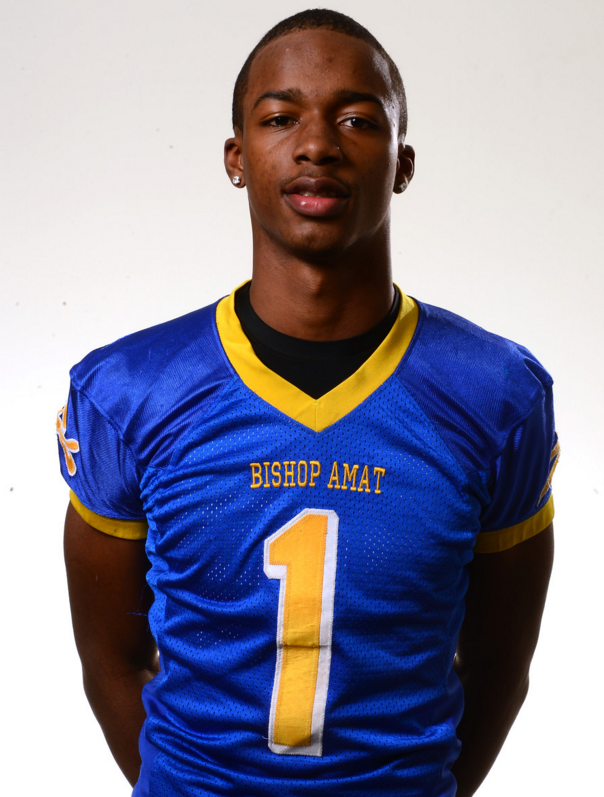 TYLER VAUGHNS, Receiver, Bishop Amat, Sr.
Last year’s Tribune Player of the Year posted another dynamite season for the Lancers. Vaughns caught 84 balls for 1,319 yards and 13 touchdowns. Vaughns also had two rushing touchdowns and two interceptions while on defense. Vaughns had five games with 100 yards or more receiving. He was named co-MVP of the Mission League. Vaughns is a verbal commit to USC. 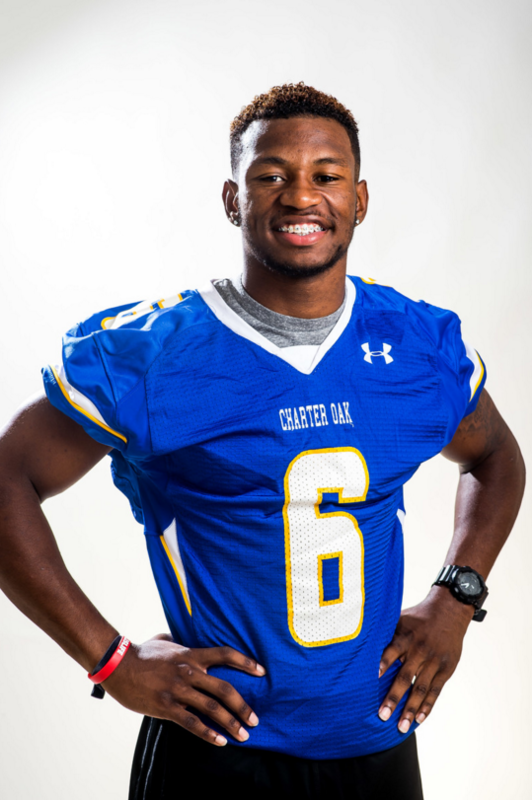 DAREON NASH, Receiver, Charter Oak, Sr.
Nash became one of the Chargers’ top play makers on both sides of the ball this season. He led the team in touchdown receptions with 13 and had 786 yards on 63 receptions. On defense, Nash was a lock-down corner and had five interceptions and eight passes deflected. Nash was an all-CIF selection at receiver and will play next season at Montana. 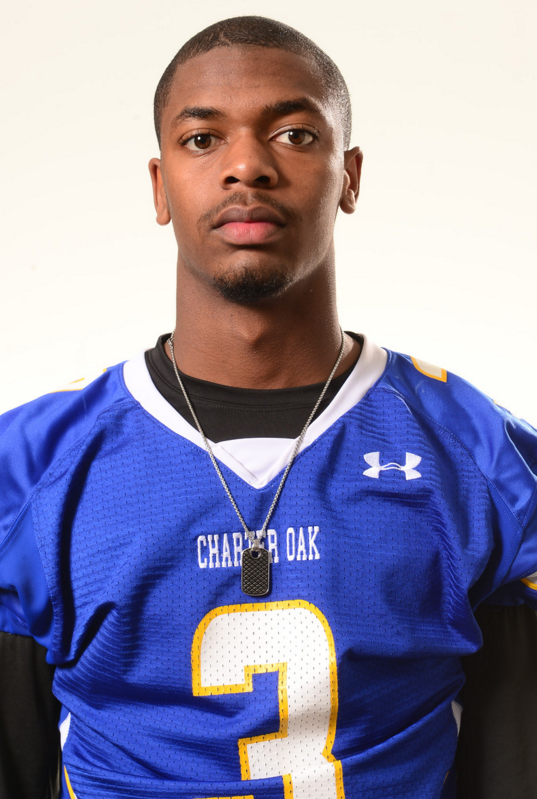 BRIAN CASTEEL, Receiver, Charter Oak, Jr.
Casteel led the Chargers in receiving yards with 913 yards on 57 receptions with nine touchdowns. He was also a force on defense, recording 46 tackles as a defensive back and hauling in three interceptions. Casteel was an all-CIF and all-Hacienda League selection and will enter next season as arguably the most coveted college recruit in the area. MATT FINK, All-purpose, Glendora, Sr.
Fink showed why he’s one of the top dual-threat quarterbacks on the West Coast this season. The USC-bound senior threw for 1,258 yards and 15 touchdowns. He also rushed for 1,106 yards and 17 touchdowns as Glendora swept the Palomares League and won 11 games. Fink was named Palomares League Athlete of the Year and was an all-CIF selection in the Central Division. 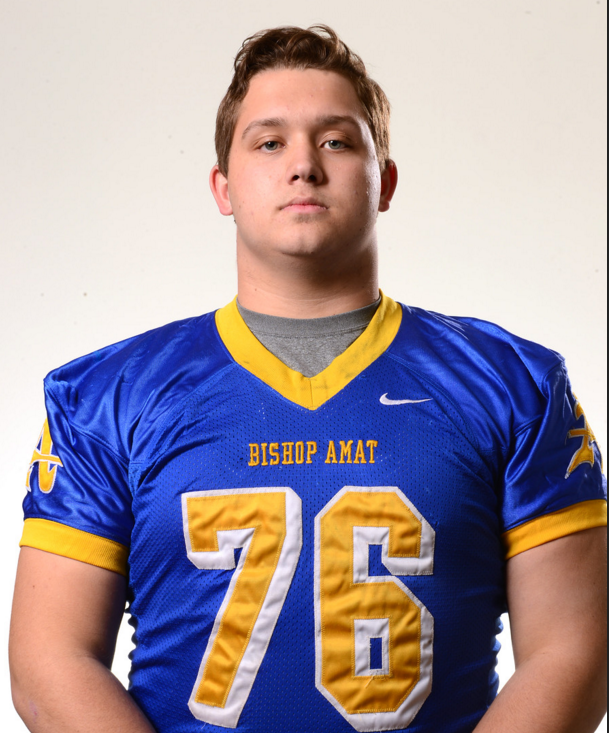 MATT BRAYTON, Offensive line, Bishop Amat, Sr.
Bishop Amat’s balanced offense featured an exceptional offensive line with Brayton being the headliner. The 6-4, 300-pound senior helped pave the way for an offense that piled up over 5,000 yards. Amat averaged 43 points per game. Brayton was named co-Lineman of the Year in the Mission League. Brayton will play at UNLV next season. 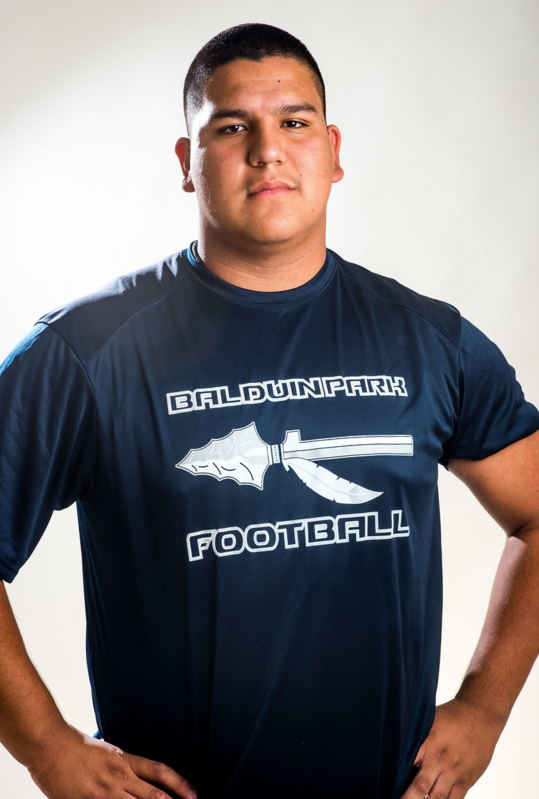 FRANCISCO PEREZ, Offensive line, Baldwin Park, Sr.
Perez entered the season as the area’s most heavily recruited lineman, and he certainly showed why. With Perez paving the way, the Braves won seven games and swept the Montview League. Baldwin Park’s offense was balanced, thanks to Perez paving the way. He was named Montview League Lineman of the Year and all-CIF in the Mid-Valley Division. Perez has given a verbal commit to play at Cal. 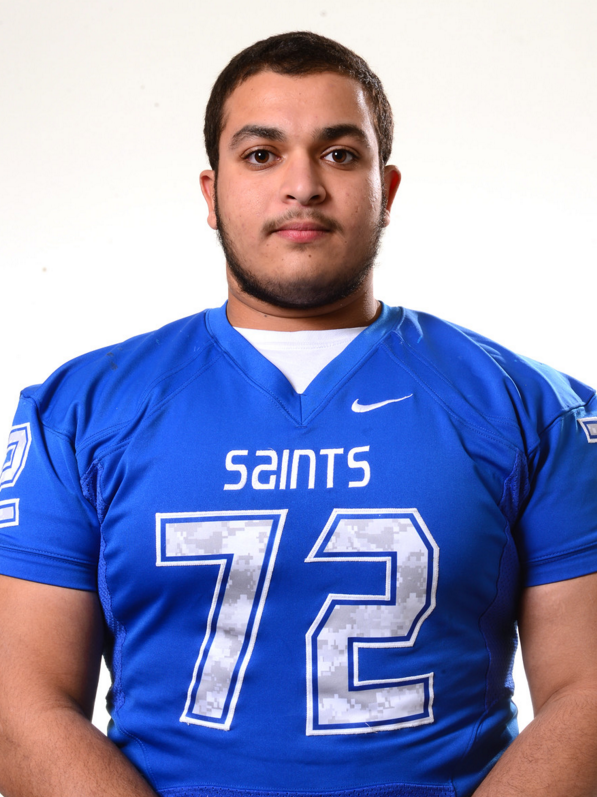 YOUSSEF HANNA, Offensive line, San Dimas, Sr.
Somebody had to pave the way for a San Dimas offense that rolled up over 4,600 yards rushing. Hanna was a major part of that. San Dimas’ ball-control offense brutalized opposing defenses to the tune of nearly 40 points per game. Hanna, 6-2, 275, was a huge part of that. For his efforts, Hanna was named Valle Vista League Lineman of the Year. 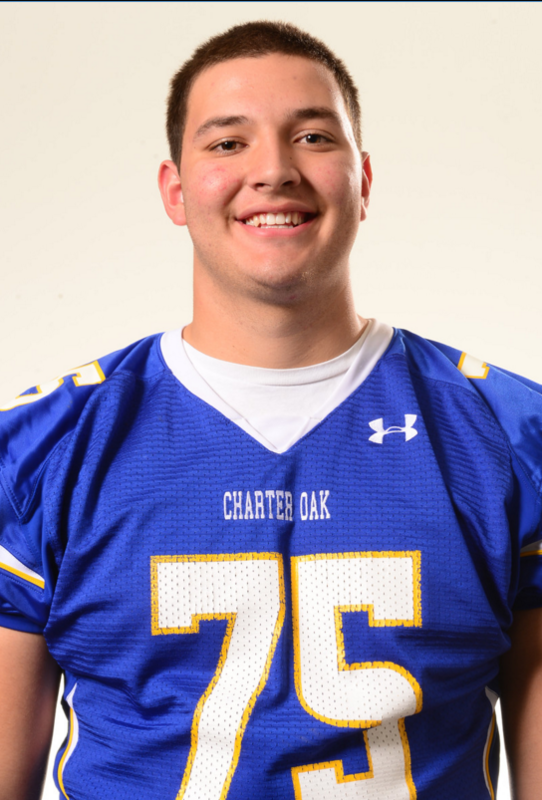 KYLE MORALES, Offensive line, Charter Oak, Sr.
Morales gave the Chargers a big-tine lineman to build around and he didn’t disappoint. 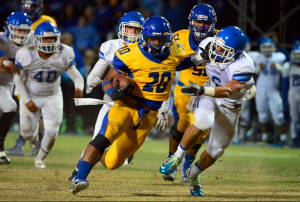 Charter Oak averaged close to 42 points per game this season, and nearly passed and rushed for 3,000 yards each. Morales, 6-4, 275, helped paved the way for all of that. 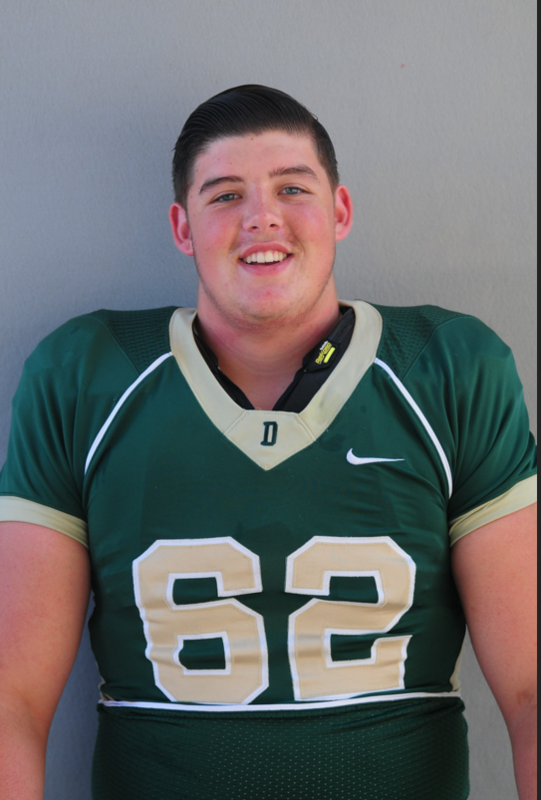 He was named all-CIF and all-Hacienda League at offensive line. He will play at UC Davis next season. LIAM RYAN,Offensive line, Damien, Sr.
Ryan justified the preseason by hype helping Damien to one of the area’s best smash-mouth running attacks. Ryan aided in clearing the way for a Spartans’ ground attack that piled up more than 2,000 yards. The 6-foot-6, 270-pounder had plenty of interest from college recruiters but gave a verbal commit to Washington St. in December. He was a first-team all-Baseline League selection. 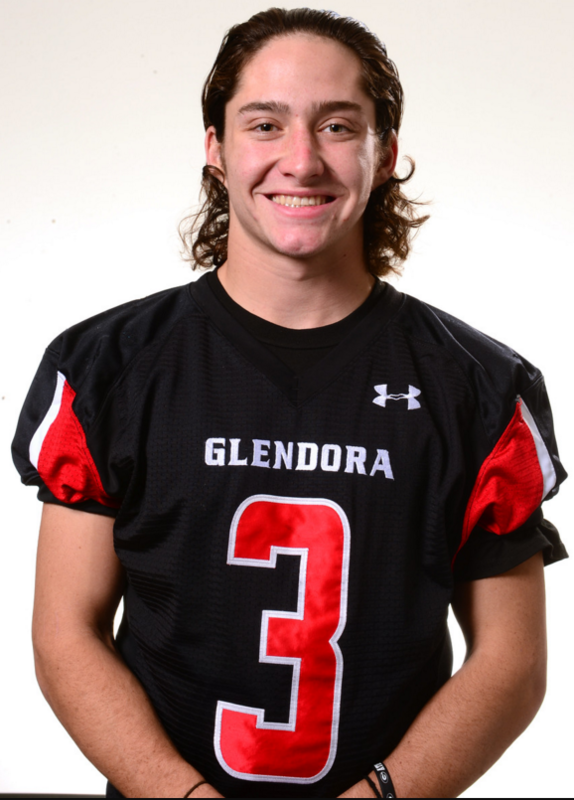 CALEB WATKINS, Kicker, Glendora, Sr.
Watkins makes the All-Area Team for the second consecutive season. 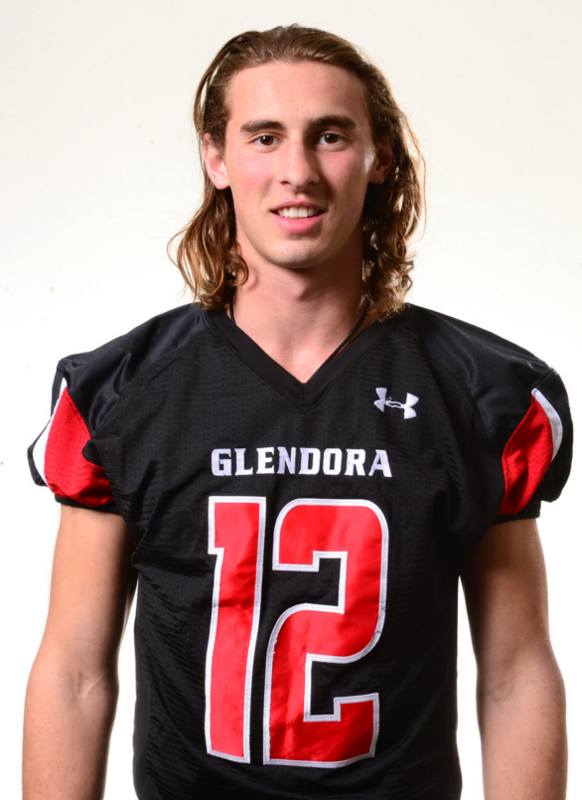 The sure-footed senior handled all of Glendora’s kicking duties with aplomb. He made seven field goals, with a long of 41 yards, to with 40 extra points. Watkins had 49 touchbacks on kickoffs an 10 times pinned the opponent inside its own 20-yard-line on punts. He averaged over 35 yards per punt and as an all-Palomares League and all-CIF Central Division selection. WILLIAM KELLY, Defensive line, Bishop Amat, Sr.
Kelly was a force up front for the Lancers as he parlayed his speed into a very disruptive season off the edge. Kelly finished with 78 tackles, including a team-best eight tackles for loss. Kelly also had four sacks. His best game of the season came in a 12-tackle, nine solo, performance against Mater Dei. 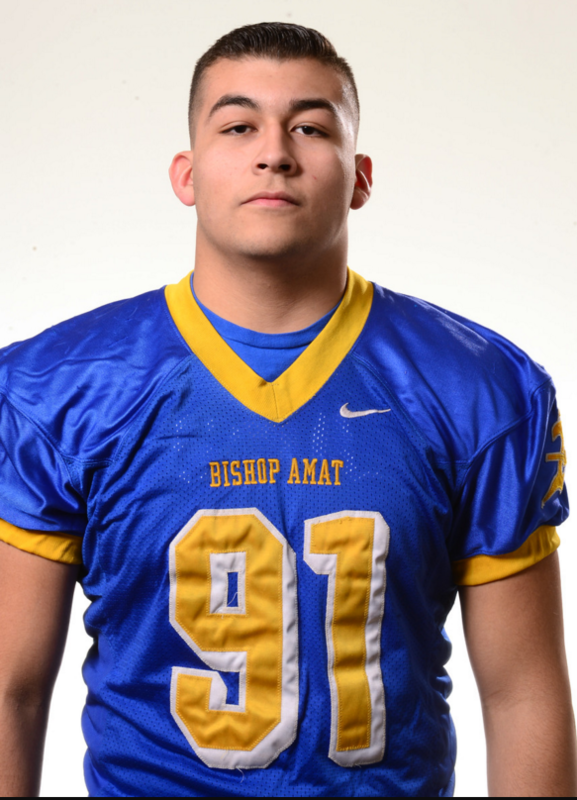 RYAN MUNOZ, Defensive line, Bishop Amat, Sr.
Munoz was once again a force up front for Amat. The defensive tackle tallied 69 tackles and 10 sacks. Munoz’s best game of the season came in a four-sack performance against Notre Dame. Munoz was a major reason why Amat’s defense allowed just 24 points per game against some of the best offenses in the Southern Section. 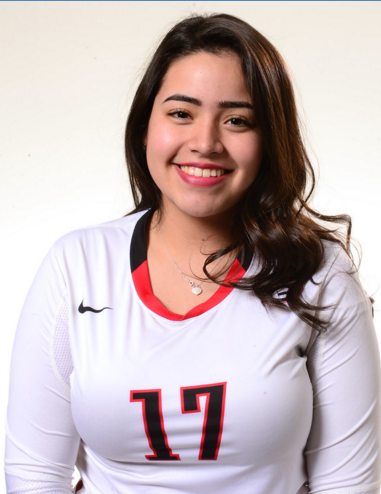 Munoz was an all-Mission League selection. 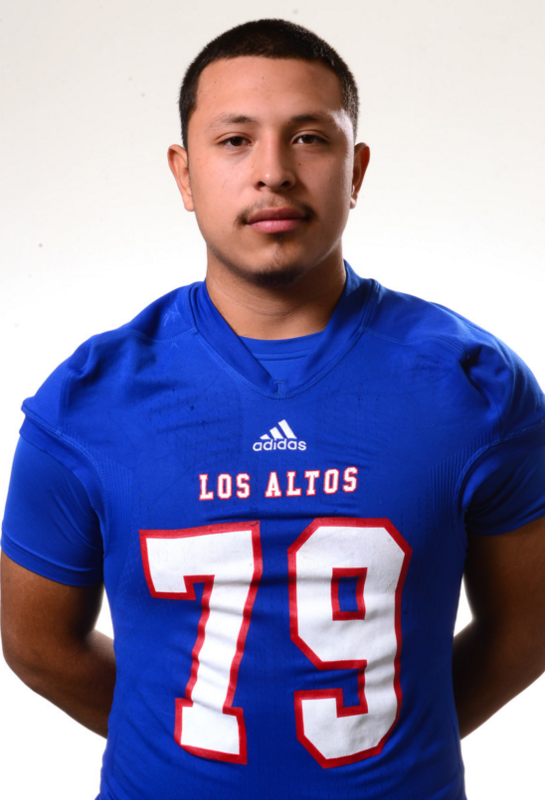 ANDREW GARCIA, Defensive line, Los Altos, Jr.
Garcia posted one of the most statistically dominant seasons in the Valley. He finished with 85 tackles, including 24 tackles for loss. He was among the area’s sack leaders with 11. Garcia also caused for fumbles. His best game was a 14-tackle performance against Chino. 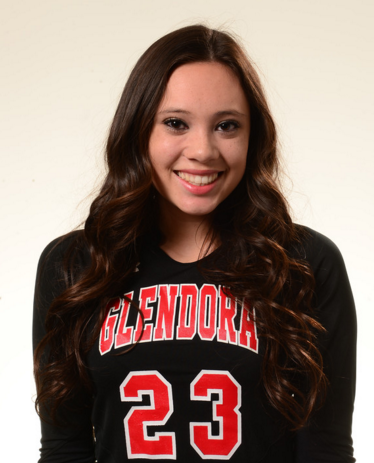 Garcia was named first-team all-Hacienda League and all-CIF Central Division. JASON VILLA, Linebacker, Arroyo, Jr.
a was the rock in the center of Arroyo’s defense and was simply dominant at several times this season. Villa finished with a whopping 184 tackles, including 14 tackles for loss. He also had three interceptions and four caused fumbles to go with two fumble recoveries. 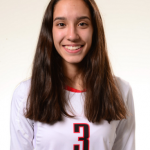 After helping Arroyo win the Mission Valley League, Villa was named league MVP. 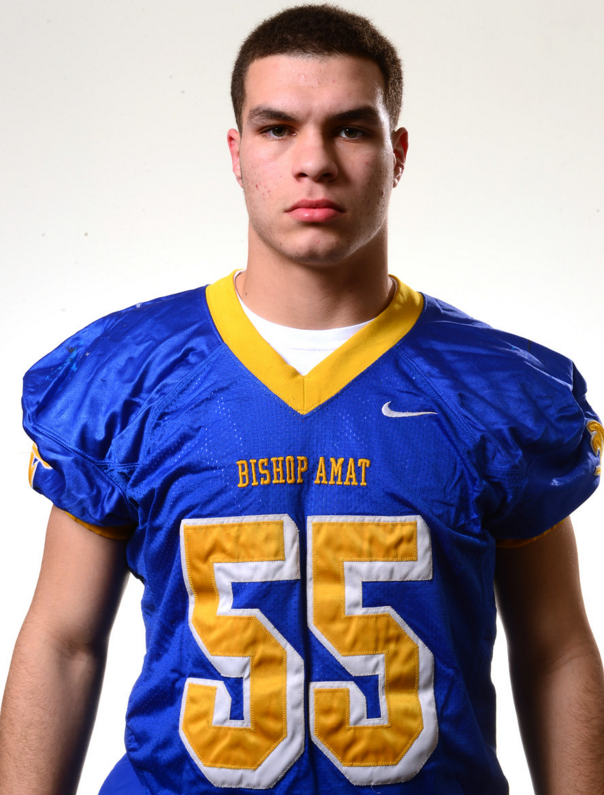 MATT TERLIZZI, Linebacker, Bishop Amat, Sr.
Terlizzi was a tackling machine for the 10-win Lancers. 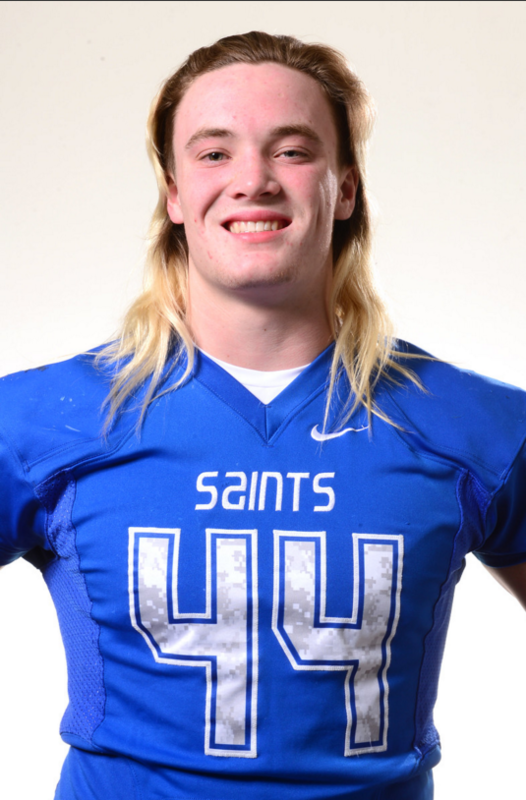 He tallied a whopping 129 tackles this season as the rock in the middle of Amat’s defense. Terlizzi had seven games this season with double-digit tackles. He had a pair of 17-tackle performances against Mater Dei and Loyola, and was a first-team all-Mission League selection. 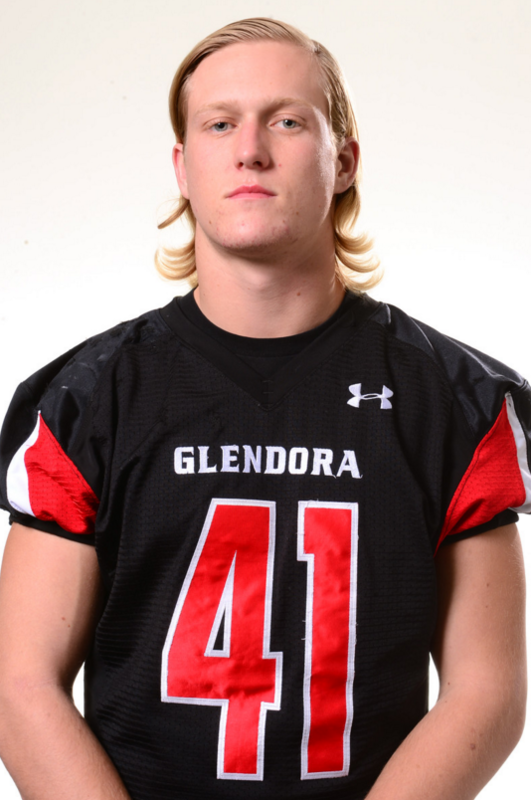 COREY TAYLOR, Linebacker, Glendora, Sr.
Taylor was a tackling machine for the Tartans and a key reason why Glendora allowed only 15.9 points per game this season. 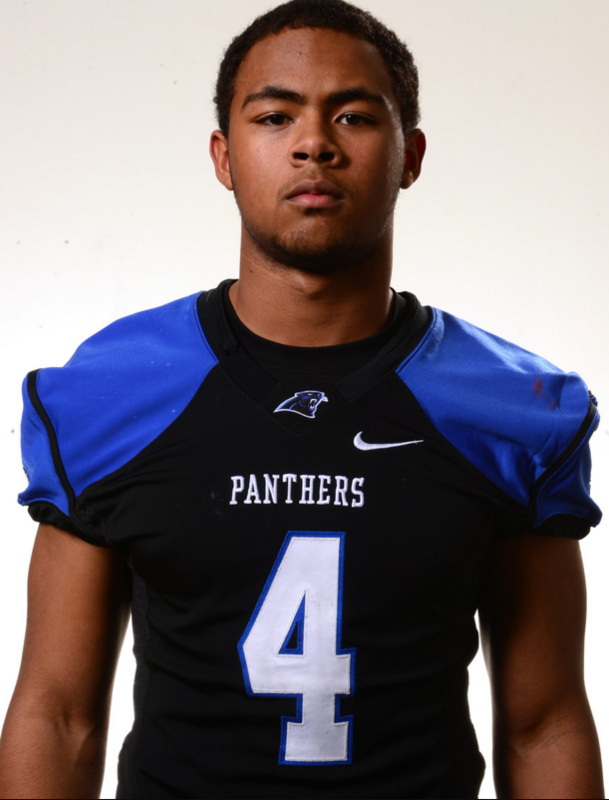 Taylor was among the area’s tackling leaders with 124, including 23 tackles for loss. He also contributed on offense, catching seven touchdown passes. 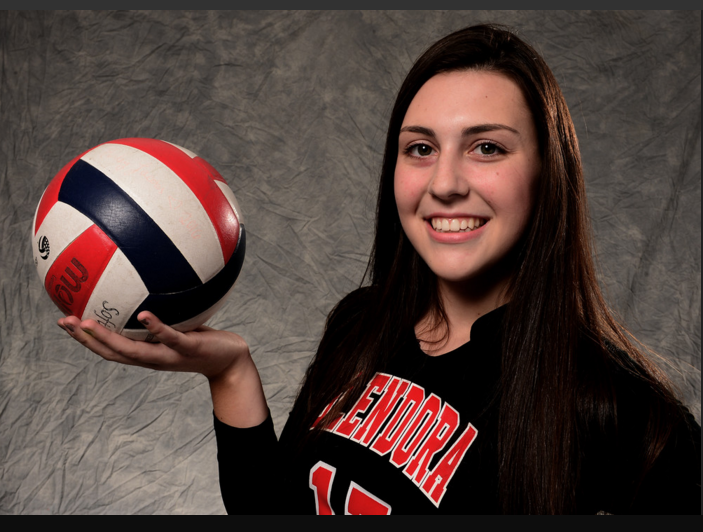 Taylor was a first-team all-Palomares League and all-CIF Central Division selection. DESHAWN ELLIS, Linebacker, Diamond Ranch, Sr.
CHRIS GASTON, Defensive back, Bishop Amat, Sr.
Gaston showed why he is one of the most highly recruited corner backs on the West Coast this season. The 6-foot-2 cover man picked off three passes, but most teams simply stayed away from his side. Gaston also chipped in with 49 tackles. He was named first-team all-Mission League. After being an early commit to UCLA, Gaston opened his recruitment back up and will play on Saturdays next fall. 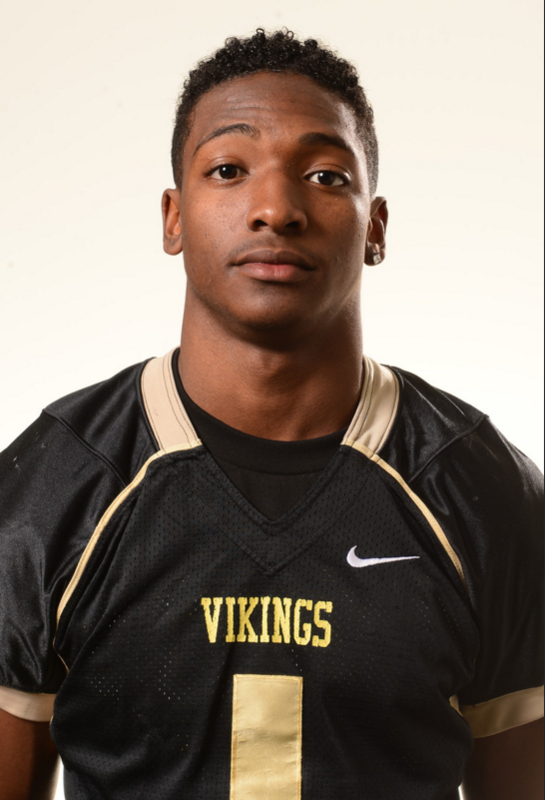 ANTUWAN AYERS, Defensive back, Northview, Jr.
Ayers was advertised for the Vikings. He made his presence felt in so many ways that the Vikings won 10 games and swept the Valle Vista League. The junior led Northview in receiving with 809 yards and seven touchdowns. He also had 421 yards on kick returns, 269 on punt returns and 78 on interception returns. Ayers finished with 84 tackles, four caused fumbles and three interceptions. He was named MVP of the Valle Vista League. 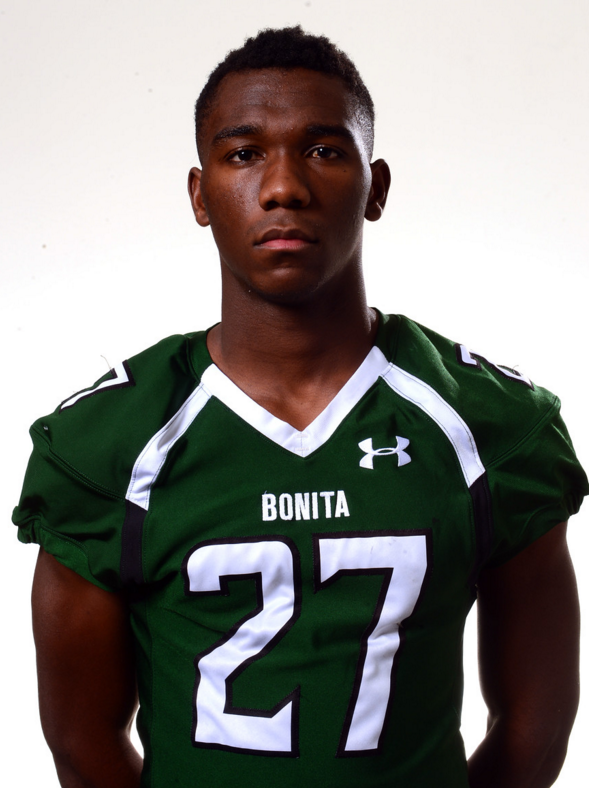 AMIR AINSWORTH, Defensive back, Bonita, Sr.
Ainsworth patrolled the back-end of Bonita’s defense admirably this season. He piled up a team-leading 96 tackles to go along with two interceptions. Ainsworth had five double-figure tackle performance, highlighted by an 18-tackle night against Claremont. For his efforts, Ainsworth was named Defensive MVP of the Palomares League. 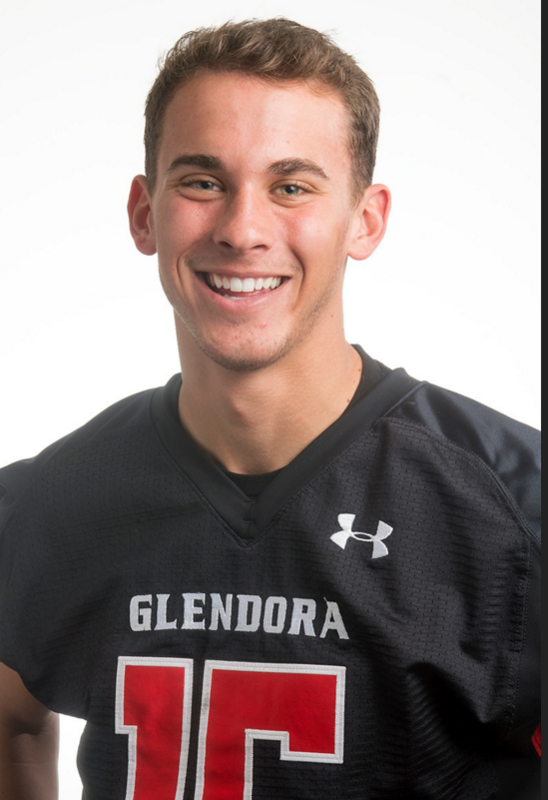 TYLER SCHOENICK, Defensive back, Glendora, Sr.
Schoenick was a force on offense and defense this season for the 11-win Tartans. Schoenick tallied 80 tackles, including 13 for loss, while on defense. He also had five interceptions and nine passes deflected. On offense, he had 24 receptions for 319 yards and four touchdowns. Schoenick was both a all-Palomares League and all-CIF Central Division selection at defensive back. 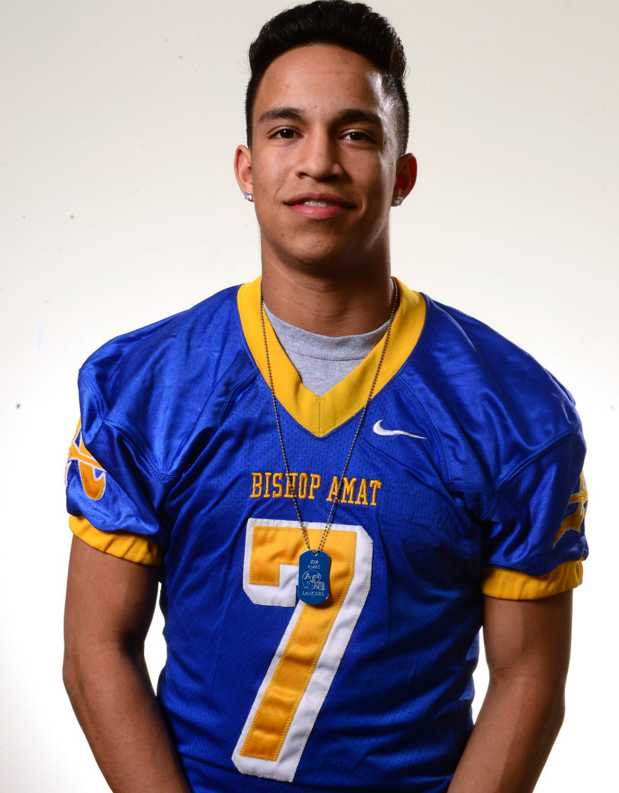 DAMIAN GARCIA, Punter, Bishop Amat, Sr. In addition to being Amat’s star quarterback, Garcia also had one of the top legs in the area. The senior had the area’s best per kick average of 38.6 yards per punt. He pinned the opponent inside its own 20 six times. At quarterback, Garcia threw for 2,581 yards and 22 touchdowns. He also rushed for 452 yards and four touchdowns. QB — Steven Comstock, Northview, So. RB — Dylan Thigpen, Damien, Sr.
RB — Roy Barajas, El Monte, Sr.
WR — Dominic Ramirez, Northview, Sr.
WR — Quinn Cotter, South Hills, Sr.
WR — Brian Navarro, Bassett, Sr.
ALL — Andrew Apodaca, Covina, Sr.
OL — David Label, Glendora, Sr.
OL — Tim Dolan, Bishop Amat, Sr.
OL — Jael Martinez, Northview, Jr.
OL — Xavian Morales, West Covina, Sr.
OL — Baylee Smith, Bonita, Sr.
K — Garrett Deane, Bonita, Jr.
DL — Andres Quezada, West Covina, Sr.
DL — Arturo Vasquez, Bassett, Sr.
DL — Logan Zylstra, Bonita, Jr.
LB — Dillon Ontiveros, Charter Oak, Jr.
LB — Nathan Smedley, Bonita, Sr.
LB — Steven Ojeda, San Dimas, Sr.
LB — Elijah Grijalva, Northview, Sr.
DB — Damien Washington, Charter Oak, Sr.
DB — Andrew Guzman, Covina, Sr.
DB — Aaron Austin, Bishop Amat, Sr.
DB — Andres Hooper, Northview, Sr.
P — Hunter White, Los Altos, Jr. The two rivals had met earlier in the season with Charter Oak posting a 28-7 win over the Tartans in late September. That loss didn’t well with Glendora and when the playoff brackets were announced it was obvious the two teams were on a collision for a high-stakes rematch in the Central Division semifinals. The moment came the night after Thanksgiving and a large crowd for both sides saw Glendora bolt to a 14-0 lead. But Charter Oak stormed back in the second half, blanked the Tartans and pulled away to advance to the championship game. East Valley: Saddleback Valley Chr. Dwight Ramos leads Walnut to Covina title: The Walnut High School boys basketball team wrapped up the 62nd Annual Covina Christmas Classic with its fourth consecutive victory, beating Los Altos 71-46 to win the championship Wednesday evening.The Mustangs (13-2) were led by Dwight Ramos, who was named tournament MVP. The senior had a double-double in the first 11 minutes of the game and finished with 32 points and 23 rebounds to go along with four assists and a pair of steals. 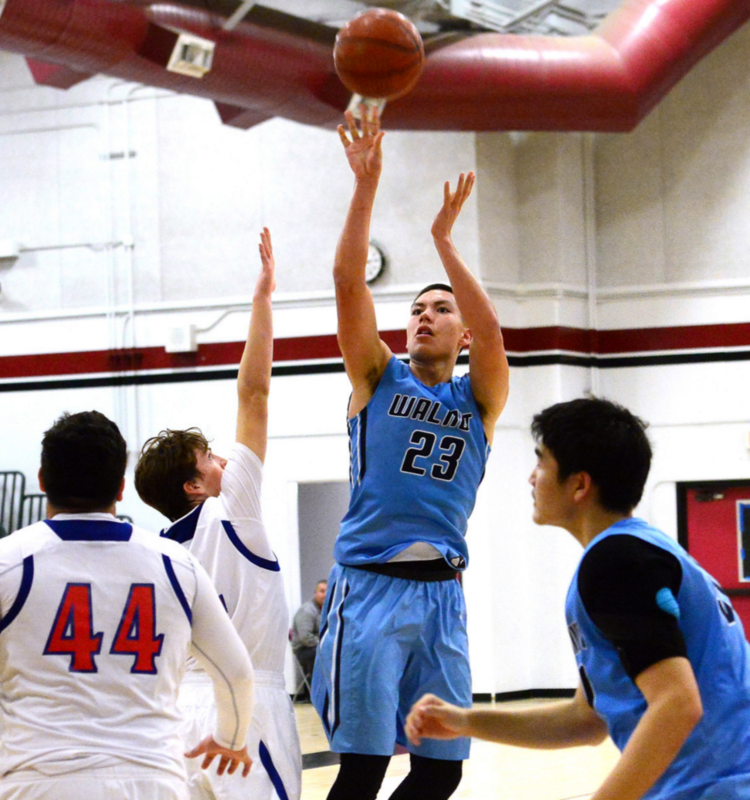 Covina Semifinals Recap: Walnut High School and Los Altos set up a rematch of last year’s Covina Christmas Classic, each winning their semifinals at Covina High School on Tuesday evening. Los Altos eliminated Bonita with a 67-62 victory after Walnut defeated Bishop Amat 67-60 in the first semifinal. The final will be played at 7:30 p.m. on Wednesday night. Los Altos won last year’s final 55-52, but Walnut won both of the other meetings between the two programs in Hacienda League play.Freshman Jarod Lucas scored a game-high 31 points for Los Altos (8-0), pushing his tournament total to 97 points heading into the championship. The tournament record is 130 points. Quarterfinal Wrap-up: Freshman Jared Lucas isn’t wasting any time establishing himself as one of the area’s most dynamic players.Lucas scored 45 points, making 14 of 23 shots from the field, to go along with four rebounds and two assists to lead Los Altos to an 80-62 win over Covina on Monday to secure a semifinal spot in the Covina Christmas Classic.Los Altos (7-0) will play Bonita in the 7:30 p.m. semifinal on Tuesday. Bonita defeated Brea Olinda comfortably 65-42 in its quarterfinal. San Dimas gives legendary coach Gary Prestesater his 500th career coaching victory: The first round of the Covina boys basketball tournament started on a special note. San Dimas coach Gordon Hamlow asked legendary Saints coach Gary Prestesater, who retired with 499 coaching wins, to coach the opening round against Duarte and the Saints delivered with a 63-14 win, giving Presesater his 500th career victory. Rowland 73, Glenn 30 — Jonathan Hu had 15 points and seven rebounds and Anthony Lehr added 13 points and 10 rebounds for the Raiders in the final round of the Nogales Tournament. Curtis Hong had 12 points and Johnny Ho had 11 points for Rowland (6-7). Sean Nakama earned all-tournament honors. Charter Oak 70, Wilson 69, 2OT — William Vest had 20 points and Tahji Bell added 19 points for the Chargers (6-5) in the final round of the Wilson Tournament. Justin Chan had 23 points for Wilson. Bonita 61, Bishop Amat 49 — Joe Quintana had 20 points, eight rebounds and three assists and Tyler Poepping had 15 points and five assists to lead the Bearcats (9-3) to place third at the Covina Christmas Classic. The Bearcats had a 21-0 lead in the first half. 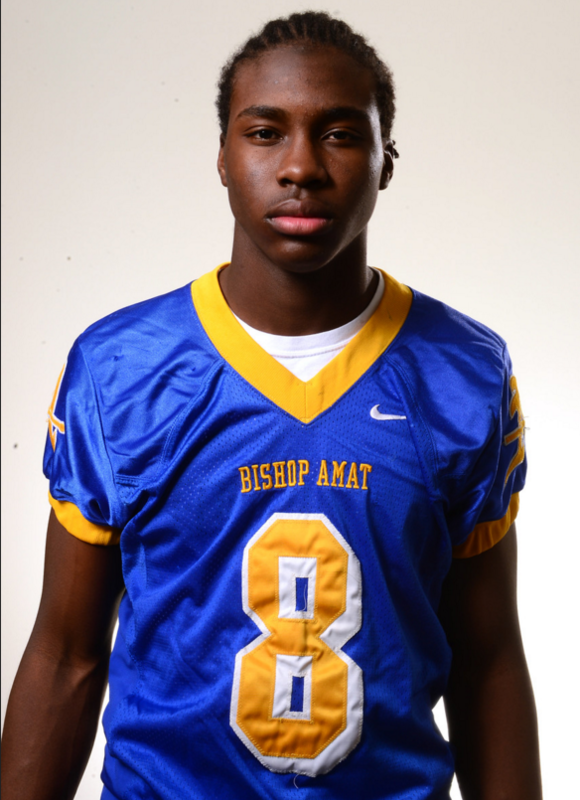 Harrison Kay had 11 points for Bishop Amat (11-2). Quintana was an all-tournament selection. San Dimas 48, Brea 39 — Ronny Rafeh registered 19 points and seven rebounds and Donnell Leffridge added nine points to lead the Saints (7-5) to place seventh at the Covina Christmas Classic. Leffridge was an all-tournament selection. Diamond Ranch 56, Compton 47 — Ryan Haywood had 21 points and Roman Silva had 15 points and 13 rebounds for the Panthers (7-6) in the final round of the Torrey Pines Holiday Classic. St. Lucy’s 37, Ontario 32 — Dani Tostado had 16 points to lead the Regents (12-1) to the Ontario Tournament championship. The Regents’ Natalie Guillen was named tournament MVP. Duarte 50, Crescenta Valley 39 — MacKenzie Barnes had 22 points, seven rebounds and five assists and Ryley Thompson added 16 points to lead the Falcons (11-2) to the West Coast Holiday Tournament victory. Rowland 5, Viewpoint 2 — Melissa Rodriguez scored three goals and Melanie Romero scored twice and had an assist to lead the Raiders (8-4) to the consolation championship at the Ontario Christian Christmas Classic. Romero and Daniella Perez were both all-tournament selections. Glendora 59, La Serna 41 — Michelle Can had 23 points and Alex Lowden added 11 points for the Tartans (10-3) in a Glendora Tournament victory. Chino Hills 58, West Covina 35 — Janessa Thropay had 15 points, seven rebounds and four assists and Moriah Serrano added 11 points for the Huskies (9-4) in a Glendora Tournament victory. Ally Seebalac had 10 points for Chino Hills. St. Lucy’s 28, Wilson 27 — Natalie Guillen had nine points to lead the Regents (11-1) to the Ontario Tournament championship game. Duarte 61, Pasadena Poly 39 — MacKenzie Barnes had 15 points and seven rebounds and Patricia Morris added 12 points and 10 rebounds for the Falcons (10-2) in a West Coast Holiday Tournament win. Charter Oak 58, La Puente 32 — William Vest had 19 points for the Chargers (5-5) in a third-round Wilson Tournament victory. Alberto Flores had 11 points for La Puente. Fullerton 63, Rowland 53 — Sean Nakama had 12 points and five assists, Curtis Hong added 10 points and Jonathan Hu had seven points and eight rebounds for the Raiders (5-7) in a third-round Nogales Tournament loss. Bellevue 51, Diamond Ranch 38 — Ryan Haywood had 21 points for the Panthers (6-6) in a Torrey Pines Holiday Classic loss. Rowland 6, Workman 0; Rowland 4, St. Anthony 2 — Melissa Rodriguez scored twice and had two assists to lead the Raiders on their first Ontario Christian Tournament win of the day. Cecilia Swain, Melanie Romero, Tyesha Valles and Leslie Cortez each scored a goal for Rowland. Daniella Perez, Ruby Fernandez, Valles and Romero each scored a goal for Rowland (7-4) in the win over St. Anthony. La Serna 47, Rowland 44 — Jesse Garcia shot a buzzer beating three-pointer to lead the Lancers to defeat the Raiders (5-6) in a Nogales Tournament win. Curtis Hong had 23 points, Jonathan Hu added 12 points and Phil Aguiniga had nine points, five rebounds and five assists for Rowland. Carrillo 66, Charter Oak 60 — William Vent had 19 points and DJ Munoz added 14 points for the Chargers in a second-round Wilson Tournament loss. Bishop Amat 50, Cajon 46 — James St. Louis had 16 points and Harrison Kay added 11 points to lead the Lancers (11-0) to the Covina Tournament quarterfinals victory. 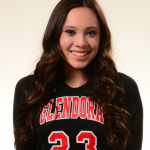 Glendora 78, Rim of the World 18 — McKayla Tilton had 23 points and Michelle Can added 16 points for the Tartans (9-3) in a Glendora pool-play tournament victory. St. Lucy’s 47, Alhambra 21 — Natalie Guillen had 29 points for the Regents (10-1) in a nonleague win. Duarte 71, Middle College 57 — MacKenzie Barnes had 14 points, 11 rebounds and eight assists and Patricia Morris added 23 points and 18 rebounds to lead the Falcons (9-2) to the West Coast Holiday Tournament victory. Bishop Amat 62, South Hills 54 — Harrison Kay had 24 points and Ryder Ruiz added 11 points for the Lancers (10-0) in a Covina Tournament victory. Norco 53, Rowland 49 — Curtis Hong registered 29 points for the Raiders (5-5) in a first-round Nogales Tournament loss. Jonathan Hu had six points and six rebounds for Rowland. Corona Contennial 59, Diamond Ranch 54 — Ryan Haywood had 21 points and six rebounds and Roman Silva added 15 points, 14 rebounds and three blocks for the Panthers (6-4) in a Torrey Pines Holiday Classic loss. Claremont 82, Charter Oak 62 — DJ Munoz had 21 points for the Chargers (4-4) in a first-round Wilson Tournament loss. Chino Hills 90, Hoover 25 — Janessa Thropay had 18 points, 14 rebounds, five assists and four steals for the Huskies (7-4) in a Glendora Christmas Tournament game. Ally Seebalac had 14 points, Kami Seto added 11 points and Dorcas Wu scored 10 points for Chino Hills. Glendora 60, Charter Oak 22 — Michelle Can had 25 points to lead the Tartans (8-3) to the Glendora Christmas Tournament win in pool play. Riley Jacobs was definitely concerned heading into her final senior volleyball season. 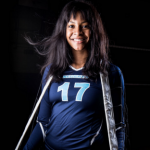 She had every right to be.While participating at a late summer camp at her future college, UNLV, she broke her left pinky finger. Not a very good omen for a setter. Not to worry. Jacobs got back into the swing of the season very quickly and helped the Tartans to back-to-back Palomares League titles. She earned Player of the Year honors. The Gladiators finally made that first big step. For the first time in school history, they played in a CIF-SS semifinal match. “I learned you can teach an old dog new tricks because I totally changed my philosophy for practice,” Divine said. The Gladiators (27-7) won their first Montview League since 2009. They lost to eventual 4A champion Desert in the semifinals. 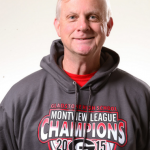 It was Divine’s 14th league title in his 22 years of coaching at Gladstone. “We had been competitive, but we were not getting better and we were not getting to the next level,” Divine said. The philosophy changed while watching a USA national team practice and scrimmage. The Regents struggled early in the Baseline League, but rallied to finish tied for second place with a 6-4 record, 13-16 overall. It created a tough CIF-SS opening-round playoff game. Yucaipa defeated St. Lucy’s in three games. UC Irvine-bound Carter still had a big season, leading St. Lucy’s with 321 kills, which was ranked 35th in the CIF-SS. Her .324 hitting average was 29th-best in the state. She had a .483 kill average. She also had 56 blocks, second on the team. Garcia finally got to settle down and play one defensive position. 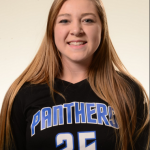 Last year the senior played libero and defensive specialist. This year she only played libero. It meant that Garcia was on the court a lot more than a defensive player, who leaves the game when rotated to the front row. She helped the Tartans to a CIF-SS 2A quarterfinal berth. Kretschmar knows what it is like to be on the losing end of the scoreboard time and time again. At one point, the Panthers were, quite frankly, not very good. They won four Hacienda League games in her freshman and sophomore seasons. But this year, the senior setter helped Diamond Ranch win its first league title in more than a decade. “It is so good to be on a team where no one expected anything of us to being a championship team,” she said. The Panthers (21-5) tied Los Altos for the league title after finishing second to the Conquerors last year. They were knocked out of the CIF-SS 2A playoffs in the second round in four games to Troy. It was not quite the season as 2014, but Duarte continued its breakout run with another 4A quarterfinal playoff run before losing to Cate. The Falcons lost to Cate for the ‘14 title. 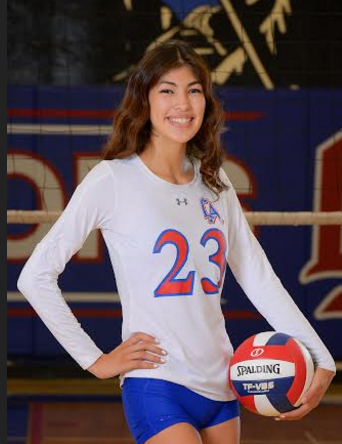 Portillo had 218 kills and a .288 hitting average, the 29th-best in the CIF-SS and 50th-best in the state. 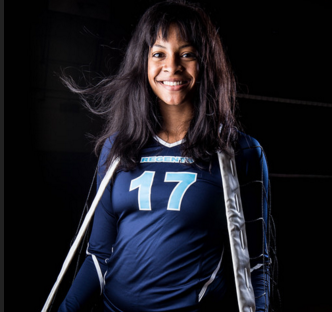 She also had 19 blocks and experienced a new role in the backcourt with 114 digs. The 2015 season was all about goals. 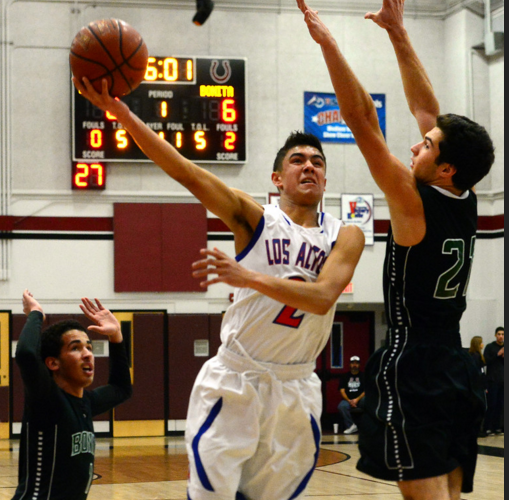 The pressure was on Los Altos and Rojo to win a fourth consecutive Hacienda League title. The Conquerors were a game behind Diamond Ranch going into the final regular-season match. Los Altos scored a 15-8 win in the fifth game of that match to create a tie for the league title and keep Rojo’s league title streak intact. 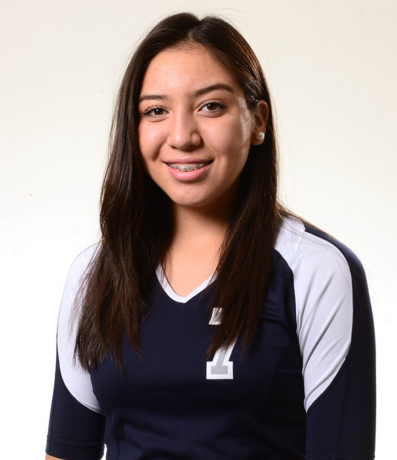 Rojo had 293 kills on the season, the 44th-best mark in the CIF-SS. She had a .404 kill average. 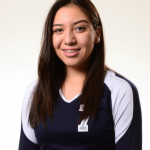 The senior also 40 aces and 32 blocks and was second on the team in digs with 204. Los Altos lost to Glendora in the second round of the 2A playoffs in three games. The Gladiators got connected, Santiago said, and it led to the best season in school history. 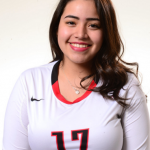 Santiago had 171 kills, only one behind middle blocker Ramos. 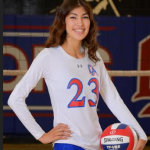 She had 80 aces, which was tied for 20th-best in the CIF-SS. 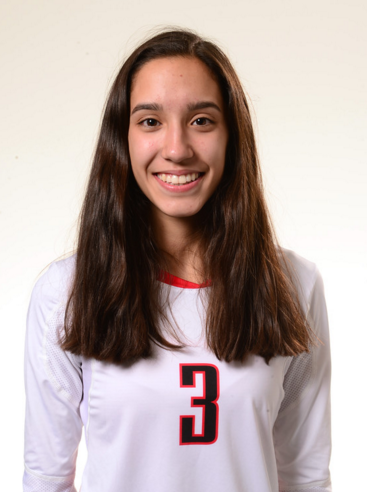 Santiago also led the team in digs, with 360, and received 425 serves, also one of the Gladiators’ top numbers.